To manage contacts in Yandex.Mail, use the address book. 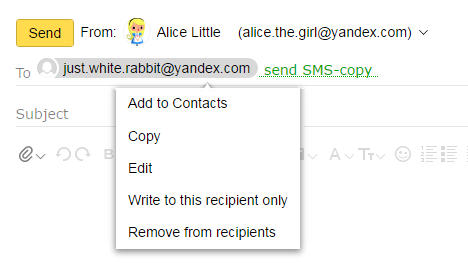 To open it, click Contacts in the upper menu in Yandex.Mail. The Personal contacts group is automatically created from the addresses of people you have previously been in touch with. If you want to disable automatically adding contacts, open the Settings → Contacts menu, deselect the Add contacts automatically option, and save your changes. In the address book interface. Click Add contact, fill in the information, and save changes. On the page where you write emails. Left-click on the address and select Add to contacts from the drop-down menu. On the contact card when reading messages. open the message and left-click on the sender's address. 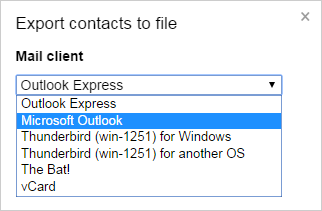 Click Add to Contacts in the window that opens. If the contact name was not specified clearly, but the recipient replied to you, then the name they entered in their own mailbox settings will be included into your address book. Through the address book interface— Select the contact from the list, click Edit, enter the new information, and save your changes. On the contact card when reading messages. open the message and left-click on the sender's address. Click Edit in the window that appears, enter the new information and save your changes. To delete a contact from your address book, select the contact's avatar and click Delete in the upper menu above the contact list. To send messages to several personal contacts at once without entering their addresses, you can group contacts and then just enter the group's name in the To field. Select the contacts you need. Select the group you need from the list or create a new one. Note. Contacts can be added to several groups at once. Open the group you need from the list on the left side of the page. Select the contacts you want to remove from the group. Attention. Contacts removed from groups will still remain in the address book. To remove a contact from the address book, click Delete contact. Any group can be renamed or deleted. To navigate to the settings, place the cursor over the group name in the list of groups in the left. Click Configure.Groups of contacts can also be configured from the menu Settings → Contacts. CSV format files are used to import and export contacts between address books of various email services and email clients. To export contacts from your Yandex.Mail address book, go to the Contacts section, click More in the top menu, then select Export contacts to file. In the window that opens, select the name of the email client and interface language, and then click Save. All contacts from your address book will be saved to your computer in a CSV file. To import contacts to your Yandex.Mail address book, go to the top menu of the Contacts section and click the More button, and then select Import contacts from file. Open the appropriate CSV file and click Save. Go to File → Open → Import. Select Export to a file and click Next. Select Comma separated values (Windows) and click Next. Select the Contacts folder for export and click Next. Enter the file name and select a path to save the file. Click Next. Click Done. The saved file can be imported to your Yandex.Mail address book or any other mail program. In the Address Book, open Tools → Export. Enter the file name, Comma separated, and select a path to save the file. Click Save. The saved file can be imported to your Yandex.Mail address book or any other mail program. Open Tools → Address Book. In the Address Book, open File → Export to → Comma separated (text). Specify the file name, the type of Text (comma separated), and select a path to save the file. Set Full name and Email to Yes and click OK. The saved file can be imported to your Yandex.Mail address book or any other mail program. You can synchronize contacts with your smartphone's address book . Smartphone contacts will be displayed in the Phone contacts group of your Yandex.Mail when you connect to the Internet (the group is created automatically when you first synchronize the devices). To display Yandex.Mail contacts on a mobile device, add them to this group. Attention. Only contacts saved to a CardDAV account when created will be synchronized from the mobile device address book. Contacts saved to a smartphone's memory or another account will not be synchronized with Yandex.Mail. Contacts are synchronized via CardDAV protocol. CardDAV is an Internet protocol for synchronizing address books with a mobile device. A CardDAV account can be configured with standard smartphone tools or via a third-party application. Click Settings → Contacts (Settings → Mail, addresses, calendars in iOS 9). Select Other from the list. Go to Settings → Contacts. Download and install CardDAV-Sync free. Select CardDAV in the Add account list. After the program verifies the data, make sure your account name is your_login@yandex.ru and Synchronize from server to phone only is disabled. Click Restore in the top menu of the Contacts section. Select the backup copy from the list. The backup copy lists the date when it was created and the number of contacts currently in the address book. Shared contacts automatically groups addresses of all your company's employees. You cannot add or delete contacts from this group. Use the integrated search, which supports direct and reverse transliteration of names and surnames, to quickly find a contact in your address book. For example, to search for your Russian friend “Ivan Petrov”, you can start typing his name using the Latin “I” or the Cyrillic “И”. When composing a message, if you enter the first letters of a name, surname, or email addresses in the To field, you will see a list of matching contacts in pop-up messages. The recipients of mail you recently sent will be listed first. To view additional information about a contact, left-click the sender's address when reading messages. You can add a phone number, date of birth, or comment by clicking Edit in the contact card. From the contact card, you can also view all messages you received from this sender, create a filter for all similar messages, or send the address to the blacklist. If your contact has profiles in social networks, you can view them in the contact card by clicking Find on the Internet. Mail uses information from open sources to search for profiles, for example, Facebook, LinkedIn, “Moy Krug”, “Odnoklassniki”, “Moy Mir” social services and other sites that support searching images and user profiles using email addresses.